Ethan has become very interested in adding and subtracting lately, so to encourage that and make it fun we made up a simple activity using flowers and pegs. Our activity was very easy to set up, we prepared lots of pegs with number stickers on them. This was all part of the fun, asking Ethan to find numbers for me and put them onto the pegs. Then I wrote the numbers from one to five on each of the foam flower cut outs. Then all that Ethan had to do was find two numbers that added together to make the number on the flower and put those numbers on the petals. He found this challenging as he had to do some subtraction as well and sort of work backwards to find the numbers that he was looking for, but he was very determined to find different number bonds for each flower. 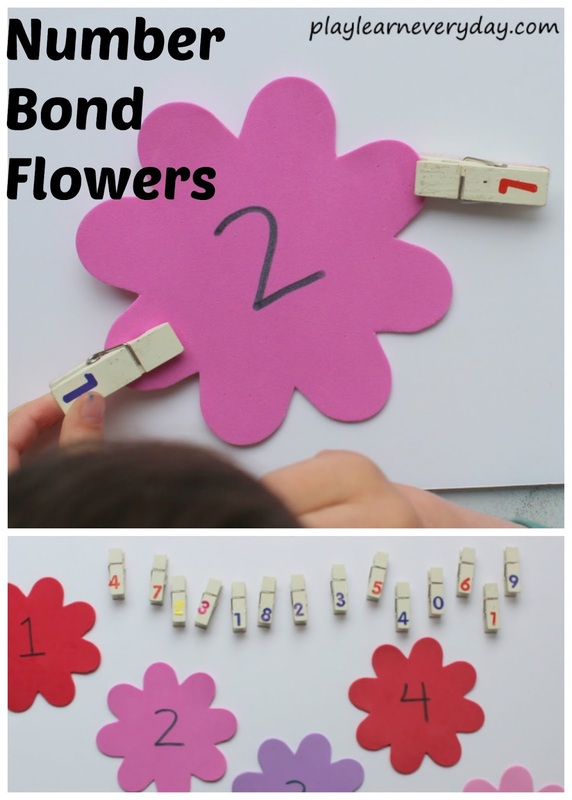 This activity will be very easy to extend as well, once Ethan is confident with these numbers I will write the numbers from six to ten on the back of the flowers to form more number bonds.